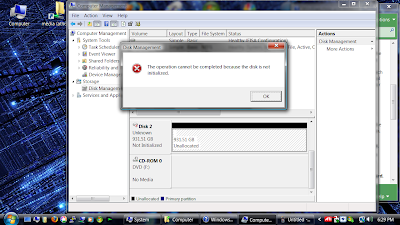 "The operation cannot be completed because the disk is not initialized." After that, it was a simple matter of re-running the format wizard on the drive. Why wasn't there a wizard that said, "You just installed an un-initialized, un-partitioned, un-formatted hard drive, what do you want to do next?" Even a button on the notification that my new hard drive was installed to further configure it would do. There could be appropriate warnings for such possibilities as other operating systems being installed on that disk, or unrecognized filesystems, or other installations. The programmer who wrote that code for Vista already knew how to do this so there was no need for a prompt. Duh! Thankyou you just saved me a smashed monitor! Thanks for taking the time to put this info up. There's nothing like getting a new drive and not being able to get it to work, or worse yet, thinking it's defective! thank you, this saved me some stress. I tried right clicking on the area you describe but the initialize option wasn't there. My disk was a brand new SATA II so maybe it was a different scenario. Anyway, using DISKPART on the command line allowed me to define a partition which initialized the drive. 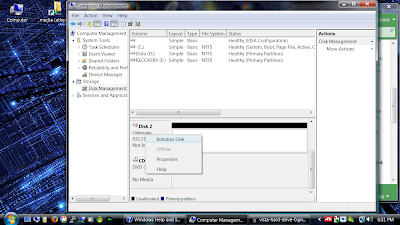 Then the status in Disk Management changed such that I could then format it. Thanks!!! That was TRULY USEFUL! !